I’ve been thinking about Saint Michael a lot this past year. As saint or archangel he is often depicted in armour holding a sword and a shield. There is a lot of symbolism to explore here. The shield is of course primarily a defensive weapon, though it can also be used to strike blows. A shield can defend the one who holds it but i it can also be held above those who cannot protect themselves. A sword can cut through the ties that bind, through ropes, and if strong enough and wielded with enough strength it can cut through chains. A sword can also be used to parry a blow from another sword, and of course it can maim and kill. In the Tarot the swords are often used to symbolise the mind and intellect. We often speak of a keen and incisive mind. The keenness of a blade represents the sharpness of the intellect. In manly cultures a warrior knight is someone who is spiritually aware and perhaps religiously devout. He is also able to fight when required. He defends the weak, the old, and the vulnerable. The Knights Templar guarded the pilgrim routes in Europe to the Holy Land. They were also the guardians of many secrets and guarded places of sanctity and power. If you face north in a magic circle then St Michael is behind you. He’s got your back. St. Michael features prominently in sacred and holy sites on pilgrimage routes and ley lines throughout Europe. Britain has its St Michael and Mary line. The Apollo line from Ireland to Greece is another. He is often depicted as slaying the dragon, vanquishing the serpent, but what is this serpent? The obvious answer from a Christian perspective is that it’s the serpent from the Garden of Eden i.e. the Devil. That seems too simplistic. Where did this serpent come from and how did it come to be wrapped around the Tree of Knowledge? In Chinese mythology serpents and dragons represent the energy that flows along the lung-mei lines that make up the energy network in the landscape. In Britain they represent the same force, wrapped around hilltops or guarding treasure in a cave i.e. piles of gold and precious that represent power. So conquering the serpent may just mean learning to harness the energy that flows in the landscape, controlling power and drawing from an inexhaustible source. 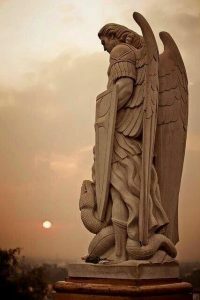 When we are threatened with violence, threats of any kind, or when we need a sharp intellect to cut through the dross then St Michael is your man.